Estimates of NPP indicate a maximum NPP of roughly 3 g C m2 day1 for submerged macrophytes compared to ~ 10-20 g C m2 day1 for emergents, and with somewhat higher values in tropical compared to temperate environments (Westlake 1975b). Macrophyte primary production is generally estimated from biomass accrual over time. Macrophyte production generally is highest in rivers of medium size where light is ample, current is moderate, turbidity is low, and strong fluctuations in depth and discharge are minimal. Even in circumstances that favor their growth, macrophytes generally contribute only a small fraction of the total energy base (Fisher and Carpenter 1976). In a Mediterranean stream, for example, macrophyte production represented, on average, 8.9% of the reach GPP (Velasco et al. 2003). Exceptions include ditches and canals in fertile regions, as well as marshes and river mouths, where macrophytes may occupy virtually all available habitat. The possible fates of macrophyte production include consumption as living tissue, secretion of dissolved organic matter, and decomposition. Very little is consumed as living plant biomass. Exudates of DOC likely benefit epiphytic autotrophs and heterotrophs, and in addition an unknown amount enters the downstream pool of DOC. Wetzel and Manny (1971) suggest as a conservative estimate that 4% of GPP of macrophytes in lakes is released as exudate. The majority consists of labile compounds of low molecular weight. Experimental addition of DOC leached from alligator weed Alternanthera philoxeroides to Ogeechee River water (Findlay et al. 1986a) and from Vallisneria americana to Hudson River water (Findlay et al. 1992) increased bacterial production and yielded higher growth efficiency than did controls, suggesting that some macrophyte C is retained in microbial biomass. 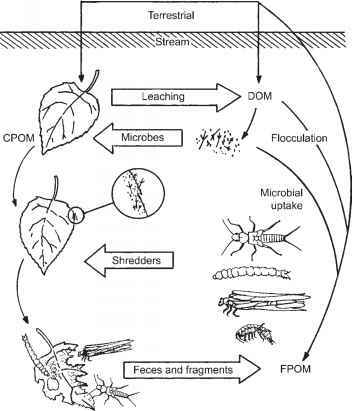 The principal fate of macrophytic primary production is to enter the detritus food chain (Polunin 1984). In addition to seasonal dieback of plants, up to 50% of new biomass is lost during the period of growth (Westlake 1975a). Because macrophytic detritus is of relatively high quality, and appears when summer periphyton might be waning and prior to autumnal leaf fall, Hill and Webster (1983) argued that these inputs may be of greater importance to consumers than would be anticipated solely from the quantity produced. In support of this suggestion, a study of decomposition of aquatic macro-phytes in the Atchafalaya River Basin, a large floodplain river in southern Louisiana, found amphipods and mayflies to be abundant on mac-rophyte detritus in fall and winter, and microbial respiration rates were high (Battle and Mihuc 2000). There is evidence, however, that food chains in the Amazon and Orinoco floodplain are fueled by phytoplankton and periphyton rather than by macrophytes, despite the abundance of the latter in these systems (Araujo-Lima et al. 1986, Hamilton et al. 1992).